Migrant workers send hundreds of billions of dollars in remittances back home every year. Between Singapore and Indonesia, we find out where the money goes. Little India and Lucky Plaza are littered with advertisements for ‘easy remittances’, ‘fast remittances’, ‘reliable remittances’, and ‘cheap remittances’. It’s commonly known that construction workers and migrant domestic workers in Singapore often send money back home. Walking around the city, it’s clear that this is a widespread phenomenon; an entire sector of the finance industry specializes in sending remittances to migrants’ host countries. Migrant workers queue to remit money home. 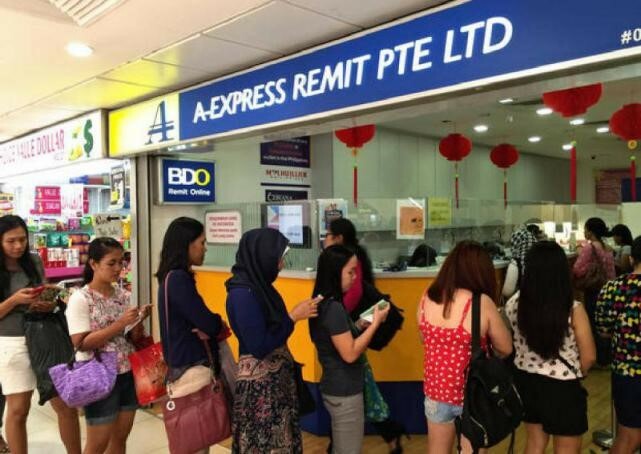 People come to Singapore under the Work Permit scheme primarily to make money, and sending remittances home is a unifying feature of the migrant worker experience. However, it remains unclear what happens when remittances are sent home. What are they spent on? How do remittances affect people left at home, especially children? The Migrating out of Poverty research team at Asia Research Institute want to understand where these remittances are going and the effect on migrants’ children, families and communities. They travelled to migrant-sending villages in Ponorogo, a region of East Java, Indonesia, to explore how remittances impact household dynamics in a community such as Ponorogo, which has a high level of outmigration. Two types of households were interviewed: households where a parent had migrated and households where no parents had migrated. The research team spoke to both the parents and older children (aged 15-24) to try and get a sense of the ripple effects migration causes. They wanted to know how children felt about remittances and their parent’s absence. How did their parent’s migration influence their personal goals? What were the emotional ramifications of their parent’s migration? Most households did not treat remittances differently from other sources of income. 35 per cent of the 1,203 households from our previous household survey in 2013 reported using remittances to cover daily expenses (Figure 1). Remittance use was also centred around medium- and long-term goals, including building/renovating homes, and savings to invest in small businesses or farmland purchases. The second biggest use of remittances was supporting their children, especially by financing their education. Many of the parents interviewed saw education as an aspirational pathway for their children to secure better jobs. Impact on children of migrant parents? The interviews show that there is no consistent narrative on how parental migration impacts on children. Some children apply themselves more in school knowing that their parents are making great sacrifices to be there; others feel abandoned and act out by letting schoolwork slip. Families lose members to migration for different lengths of time, at different points in the child(ren)’s development, and with varied effects on family dynamics. Check out our short film “Small Town, Big Dreams” to learn more! Children themselves often realize that it’s a nuanced issue. They recognize that their parents are making a trade-off between living with them and providing for them. How they perceive that choice and how it shapes their own aspirations and life-decisions varies from individual to individual. Some want to continue with school and go to university while others just want their parents to come home. There are also others who hope to work overseas. Like in nature, the ripples of migration are complex, dynamic and far-reaching. Tiffany Eng is a 4th year Psychology undergraduate from University of British Columbia (UBC) who is doing an internship at Asia Research Institute. She is pursuing a double major in Sociology and Psychology (Social and Biological streams), with emphasis on social theory, the sociology of work, globalization and migration. During her attachment, Tiffany will be providing assistance to the Asian Migration Cluster.